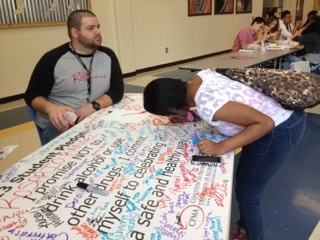 In partnership with Bartow EMS, The Coalition to Prevent the Misuse of Alcohol helped students at Cartersville, Woodland, Adairsville, and Cass High School to “Rethink the Drink” and to really think about the consequences of their decisions. The video, “Decisions,” focuses on the story of a young man and the decisions he makes during the night of his prom and the consequences that result. The video then highlights the true stories of 3 adults who made decisions to drink and drive or ride with a drunk driver. 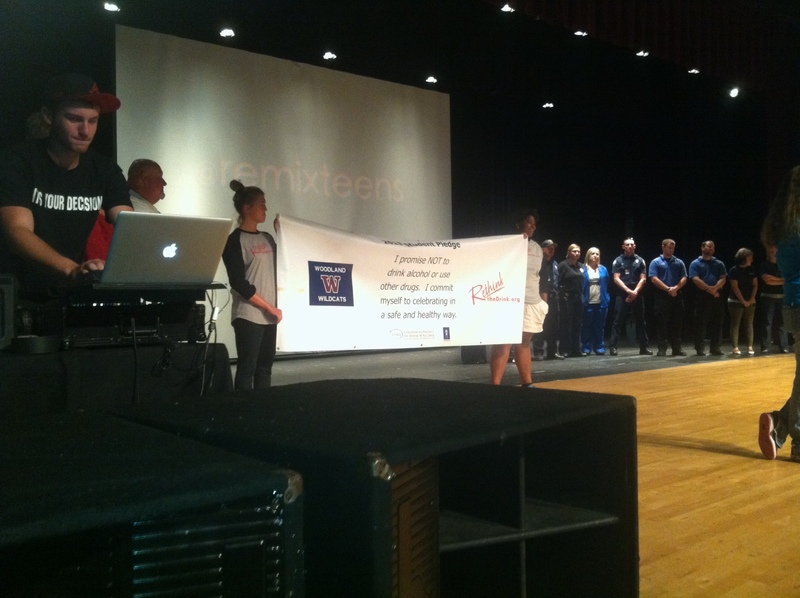 At each assembly, the video was shown and then followed up with guest speakers from the video. 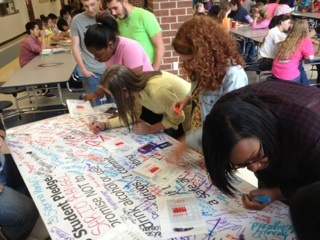 EMS workers, Taylor Forsyth and LaRay Harris, would then reenforce the message of the assembly and ask students to sign the “Rethink the Drink” by signing a pledge banner promising not to drink or use other drugs and instead, celebrate in a safe and healthy way. 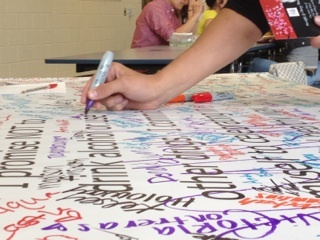 These pledge banners were then hung up at the Clarence Brown Conference Center during each of the school’s prom. 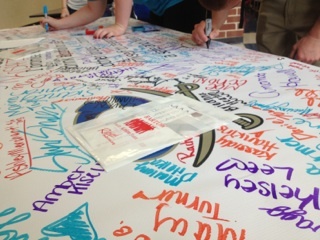 The CPMA would like to thank all of the sponsors and those who contributed, along with Bartow EMS for making everything come together so smoothly, and to the Bartow Youth Action Team members who encouraged their classmates to truly think about their decisions and to sign the pledge! 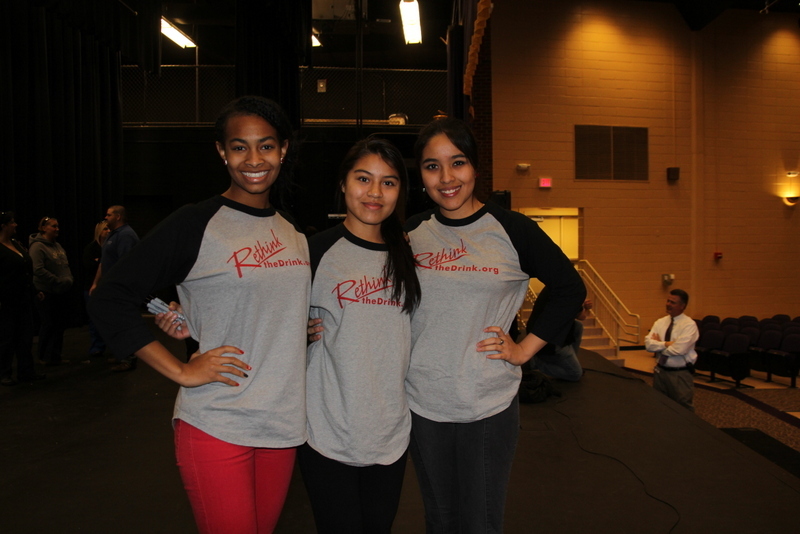 Thank you for making these prom assemblies such a phenomenal success! If you haven’t had a chance to view the new “Decisions” PSA, or you didn’t make it out to the prom assembly at Cartersville High School, NOW is your chance to see the video and attend a prom assembly! Check out the dates for the following prom assemblies near you! Hope to see you there! If you would like more information on the Coalition to Prevent the Misuse of Alcohol and our Mission, check us out here! Register now for the next webinar in the Preventing Underage Drinking series sponsored by the federal Interagency Coordinating Committee on the Prevention of Underage Drinking (ICCPUD). ICCPUD member agencies hosting this event are the National Institute on Alcohol Abuse and Alcoholism, the National Institute on Drug Abuse, the Office of National Drug Control Policy, and the Substance Abuse and Mental Health Services Administration (SAMHSA). Richard Spoth, Ph.D., F. Wendell Miller Senior Prevention Scientist and Director of the Partnerships in Prevention Science Institute, Iowa State University. Why: Nearly 10 million 12- to 20-year-olds in the United States are underage drinkers. Underage drinking poses serious negative consequences for individuals, families, and communities. This webinar series features national leaders and experts discussing the extent and nature of the problem, lessons from recent research, and evidence-based strategies for addressing underage drinking. What: In this webinar, national experts will expand on the “shape of the solution” to underage drinking introduced by Ms. Harding during the first webinar in the series. The discussion will focus on evidence-based strategies for preventing underage drinking that are age and culturally appropriate and address both individual and environmental factors. Following their presentations, panelists will engage with participants in a live question-and-answer period. Where: To find more information and to register, please visit www.stopalcoholabuse.gov. 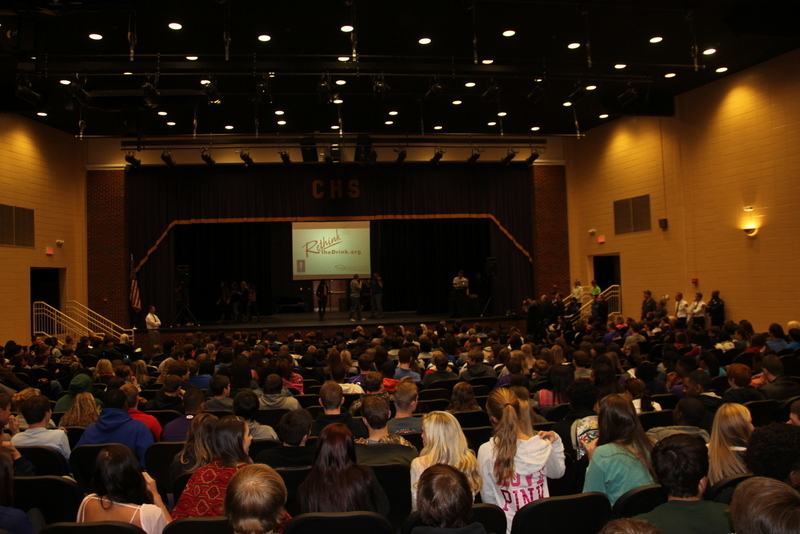 Cartersville High School’s Junior and Senior class got to be the first school to view the NEW underage drinking PSA created in partnership between Bartow EMS and the Coalition to Prevent the Misuse of Alcohol. The video called “Decisions,” focuses on the story of a high school senior who makes several big decisions during the night of his prom that results in real life consequences. 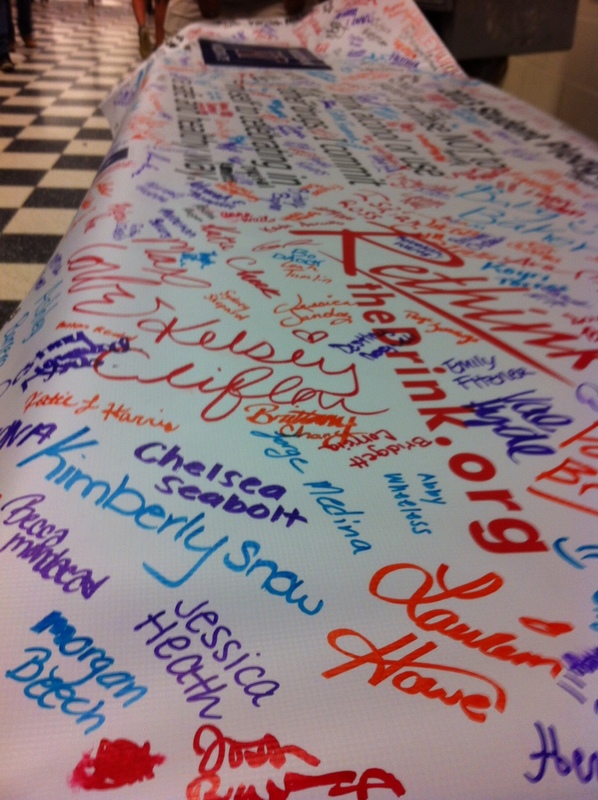 The CPMA hopes that students will choose to “Rethink the Drink” and choose to celebrate in a safe and healthy way. 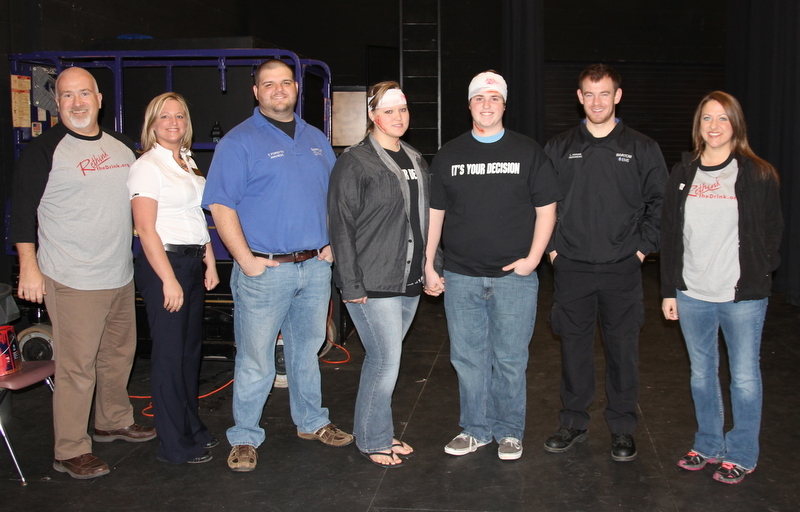 TONIGHT is the premier of the new prom video “Decisions!” The creation of this video was a joint venture between Bartow County EMS and The Coalition to Prevent the Misuse of Alcohol, and it encourages youth to “Rethink the Drink” and truly think through every decision they make. It will be shown at every prom assembly in Bartow County. Tonight’s premiere is open to the public, with the exception of students, and will begin at 7 pm at Cartersville High School. Hope to see you there!